personally, in an event widely reported positively in the media. I am not running in any political office or seeking any funding for any group, or advocating for any political figure. 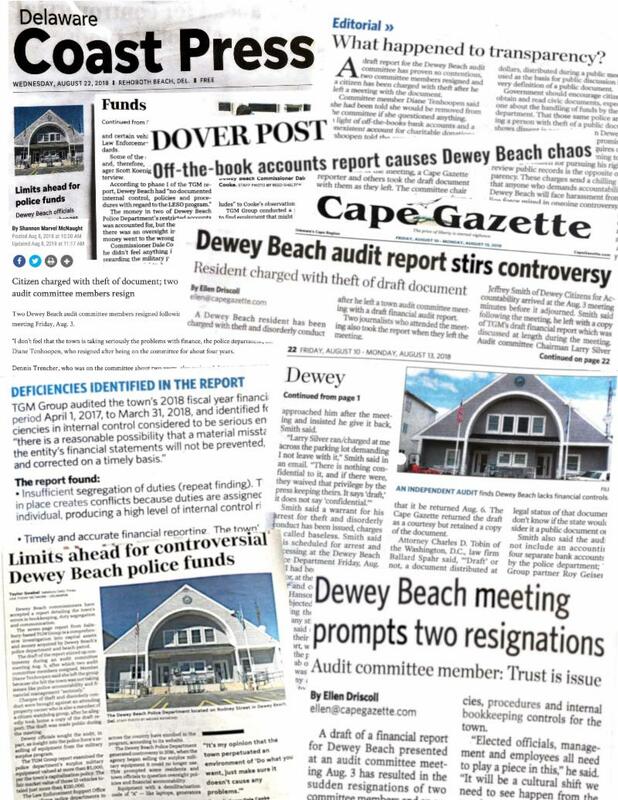 Following a August 3, 2018 meeting where prior to my arrival two audit committee members resigned in a chaotic meeting, (Off-the-book accounts report causes Dewey Beach chaos - Dover Post), the Dewey Police sought to silence my efforts with the Dewey Citizens for Accountability (DCA) seeking my arrest and obtaining an order prohibiting me from contacting any Town Commissioner or Audit Committee member (even by email) or attend any town meeting (Dewey man seeks relief from police no-contact order- Cape Gazette). As the news reported, all this because I had been given a draft copy of an Audit Report critical of the Police by the Auditor, and which the reporters themselves had and took home. But I was the one singled out, when Dewey Police on August 10 charged me with "theft" of a copy of a public document, and "disorderly conduct" for removing it from a public meeting, as all others had done. I brought it back on August 8, as the reporters did, but the Dewey Police still pursued it against me. On August 10, when I reported to Dewey Police Station, it was the first time I had ever been arrested in my life. I've been a supporter of law enforcement generally, and even having spent 20 full summers here in North Dewey have seen problems, but never so close up and personal, with the Dewey Police before. While I was aware through reading and talking to residents, of police incidents in Dewey where some quiet law abiding citizens had faced what seemed to be abuse at the hands of the police, I did not know if they were true. But I had never even heard of such a total speech and meeting ban or such actions by the police anywhere I've lived, which includes DC and NYC for over 40 years of my professional life (link to bio). Yesterday a judge in Georgetown repealed the Dewey Police Department's "No contact Order" and now I am free again to engage in civic duties of attending meetings and contacting elected officials in town on behalf of the Dewey Citizens for Accountability. Yesterday's article (Judge upholds First Amendment rights of Dewey resident - Cape Gazette) recounts what the judge said in repealing the "no-contact order". The police did not even show up to defend it but I had already by then been deprived for three weeks of the ability to attend meetings or make contact. I still have to face trial on this "theft" and "disorderly conduct" charge on October 10, at which the Dewey Police will be subject to a judicial review of their actions. It is very critical time to change Dewey. The current Town Council under Mayor TJ Redefer and Mr. Bauer needs to change because they have refused to make any changes in the town, despite the findings of the semi-audit, have taken no steps to reform the town consistent with the Walton Report (Dewey Beach Independent Investigator's Full Report), and have even tried to interfere with the audit process. (Email and Documents Re: Audit Committee Interference). If you would like to help --we are not asking for money or votes -- we just ask for your participation by clicking reply to this email and indicating you are "in" for Dewey Town reform and accountability. This list of advocates for accountability will be kept private, and will be used for mailings only by DCA to keep you informed. P.S. I have posted a video discussing the events as I drove back from the Courthouse yesterday with my wife of 26 years, Sandra. That video is posted here. But please remember to reply to this message too. P.P.S - If you are in town, please note there is a Dewey Candidates Forum at the Lions Club tomorrow (August 25) from 4pm to 6pm. Please come if you can, as it should be interesting.